Lee Sedol wins World Meijin: On January 8 and 9, the Dongjun Pharmaceutical Co. Cup: 5th World Mingren Tournament was held at the Yongji Qiyuan in Baoshan in Yunnan Province. Baoshan is a town very close to the Myanmar border and is famous for its go stones. The Yongji Qiyuan (= Ki-in) is an eight-storey building erected in 2016, so go must be prospering in this area. This is an invitational tournament, pitting the holders of the Meijin (= Mingren in Chinese and Myeongin in Korean) against each other. Iyama Yuta Meijin represented Japan and Lian Xiao Mingren China, but the Korean Myeongin title has been discontinued, so the Korean Baduk Association chose Lee Sedol as its representative. Lee repaid the faith shown in him by winning the mini-tournament. The tournament followed the usual “irregular” format for a three-player knockout. After drawing lots, Iyama and Lian were paired to play in the opening round on January 8. Taking white, Lian won this game by resignation. 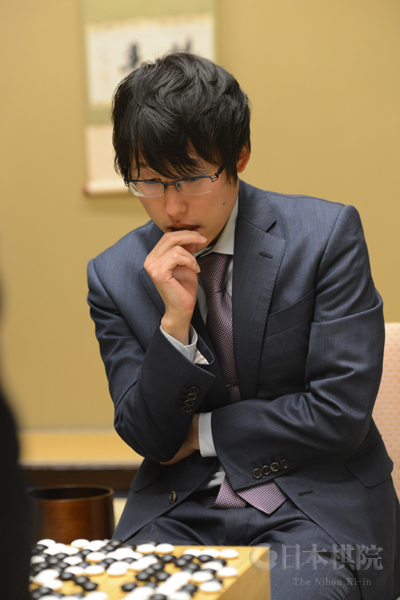 Iyama then played Lee in the second round; taking black, Lee won by resignation, so Iyama took third place. In the final, played on the 10th, Lee beat Lian (Go Weekly does not give the details) and took the first prize of 500,000 yuan (about $31,000). The Legend Pair Go tournament was held as a parallel event. This was won by the Korean pair of Yun Yongmin 3P and Suh Bongsoo 9P. The Japanese pair of Yoshida Mika 8P and Otake Hideo 9P came second. Iyama makes good start in Kisei defense: As usual, the honor of starting the official tournament program in Japan fell to the players competing for the Kisei title, though they beat two women players by just a day. The challenger for the 43rd Kisei title is Ichiriki Ryo 7P, who is making his fourth challenge for a top-seven title. The only way to win one of these titles is to overcome Iyama Yuta, as he holds all of them. So far, Ichiriki has been unsuccessful; his best effort was in the 42nd Tengen title match in 2016, when he won the second game, but he has had no luck since, losing the next two games here, and suffering whitewashes in the 65th Oza and the 43rd Tengen title matches at the end of last year. Since he also lost the final of last year’s NHK Cup (the 64th), that gave him nine successive losses to Iyama. Still, his becoming the challenger for three successive titles shows that he is one of the top players in Japan. The top-three title matches, with their eight-hour time allowances spread over two days, are a different world from the other title matches, so such a match represents a new challenge but also a new opportunity. Ichiriki also had a break of seven weeks to prepare, though he may have been distracted by university exams in January. The first game was played at the Hotel Chinzanso Tokyo on January 18 and 19, with Otake Hideo, Hon. Gosei, acting as referee. Ichiriki drew black in the nigiri. In the opening, Iyama went for territory and Ichiriki set up a large moyo. As usual these days, there were some moves influenced by AI go-playing programs, such as a 3-3 invasion by White on move six and a shoulder hit against the lower stone in a knight’s-move corner enclosure by Black with move 13. As usual with top-level games, the play was too complex for an amateur such as myself to follow. To summarize briefly, White invaded Black’s moyo with White 40. He came under severe attack but managed to settle his group in sente, so he was able to expand his territorial moyo at the top. At this point, Iyama had the lead. Ichiriki successfully invaded the top territory and perhaps took over the lead here. However, he later played a move that, in the words of the Go Weekly reporter, “lacked subtlety.” Actually, the three-page report in the go newspaper is a little hard to understand. The headlines on the second and the third pages read, “Iyama’s tenacious upset” and “Ichiriki misses his winning chance” respectively, but they are not concretely explained in the text. That’s why I wrote “perhaps” above. It seems that Ichiriki missed the best move in a center fight that concluded the game. The Yomiuri Newspaper commentator So Yokoku 9P identified Black 203 as “the final losing move.” Black resigned after move 240. After the game, Iyama commented: “I thought that if Black played correctly in the center the game was no good for me. It was a tough game, but I was lucky.” Ichiriki: “I didn’t know what was correct in the center. I made mistakes in delicate positions that were fatal.” The next game will be played on January 25 and 26.